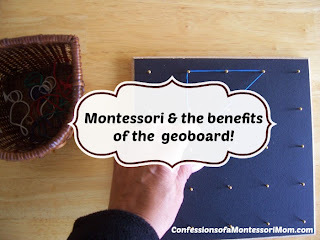 The geo board is one of the most beneficial materials in a Montessori classroom and home. It is both a Practical Life activity and a Sensorial activity, depending on how you use it (present it to the child). "Exercises in Practical Life are given the greatest importance. Exercises in Practical Life help the child mainly in his efforts to adapt to his limited space, his group, and to achieve independence. They answer his need expressed by "Let me do it by myself." They are excellent for the toddler old who is struggling to bring his psychic need in accord with his physical development by developing his motor skills. A toddler needs to express his inner needs by physical actions and inner movements. Actually, all exercises are based on getting the physical coordination to learn the exact technique to do a certain thing." 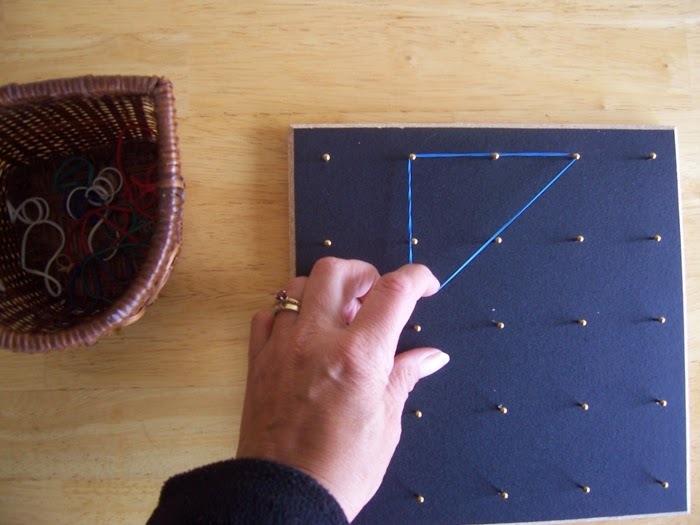 Many of the Montessori Practical Life activities also develop the pincer grip for writing and drawing. As a sensorial activity, working with geometric shapes is a great pre reading and pre writing activity! The child learns to see shapes and to name them, preparing them to see letters and numbers and to name them and eventually write them. 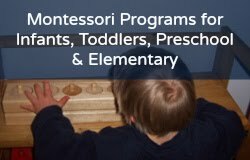 "The material in a Montessori environment increases the child's awareness and helps him classify his impressions, which brings him order and knowledge. Knowledge without order is chaos. The Sensorial Apparatus in particular fulfills its purpose by fulfilling needs of the children arising from the tendencies of man, It acts like a key in preparing the child for many aspects of life. Therefore, it can be effective only if it is limited. Each piece of Sensorial Apparatus isolates one difficulty, or one concept. 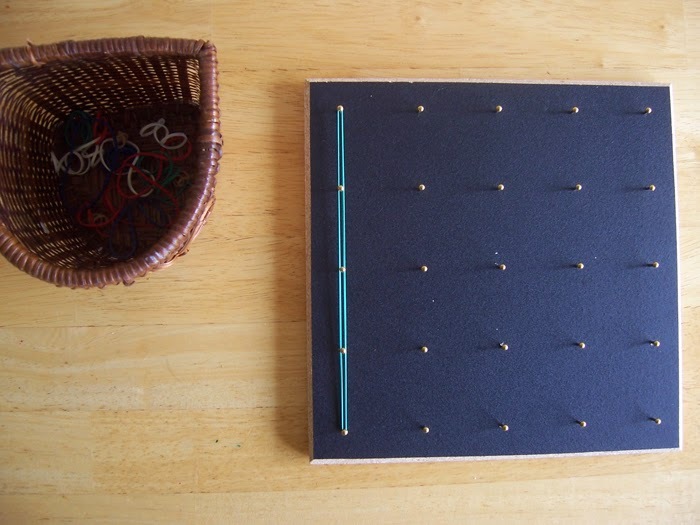 Maria Montessori calls this material "materialized abstractions," because each piece isolates whatever it is trying to bring to the child's attention. "Only such material and apparatus should be introduced to the child for which he is ready, and which he is able to master. It is the adult's responsibility to build a foundation of the child's intellectual and physical abilities by using exercises graded by their degree of difficulty. Only when this indirect preparation has taken place, when the child has mastered all the component part of an exercise, can the child master the exercise itself expertly and move on to the next activity. Therefore, not only by the right material, but also the right time in the child's development has to be chosen. "After the presentation, language is given, and then the child's interest is captured by follow up exercises or games, which bring another point of consciousness to the child and prolong his interest in the material. "And then, as follow up exercises or games, activities are selected which will encourage the child to apply his newly gained ability, and to repeat, repeat, repeat." 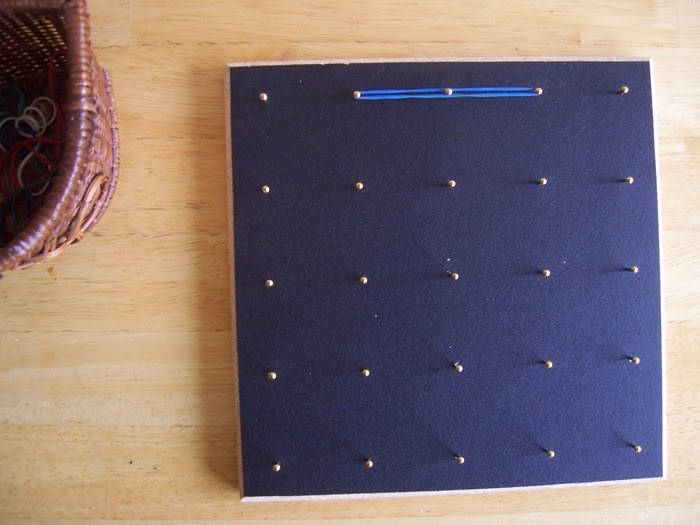 One of the best geo boards I have discovered is available at Montessori Services and it's called the Economy Geo Board, order number V17. And here is my review! After I received the Economy Geo Board from Montessori Services I set it up on the shelf for my son to use. He has shown an interest in rubber bands lately so the timing was perfect. Working with rubber bands is a great fine motor activity, but they can be chocking hazards so do not have them near infants and tots under the age of two or three. They can also hurt if shot at other children or animals so one of the first lessons of using a rubber band, and a geo board, is safety (in Montessori we call this Social Grace and Courtesy). 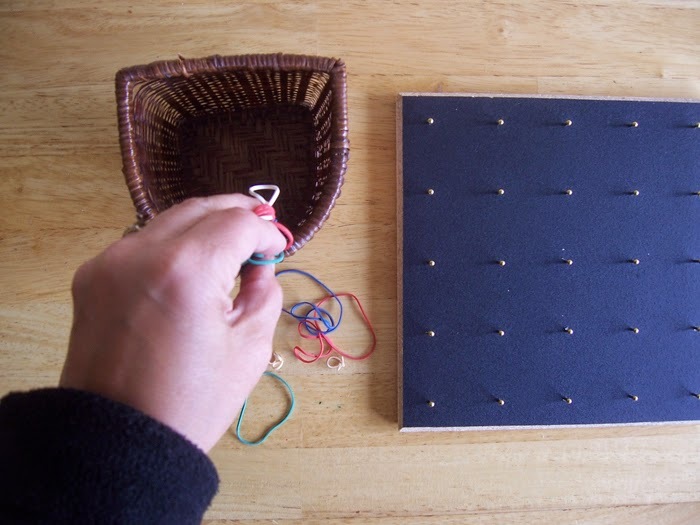 When you establish ground rules and find a safe place in your home for the geo board away from infants and tots (and curious cats and dogs) place ten to twenty rubber bands in a basket or bowl. 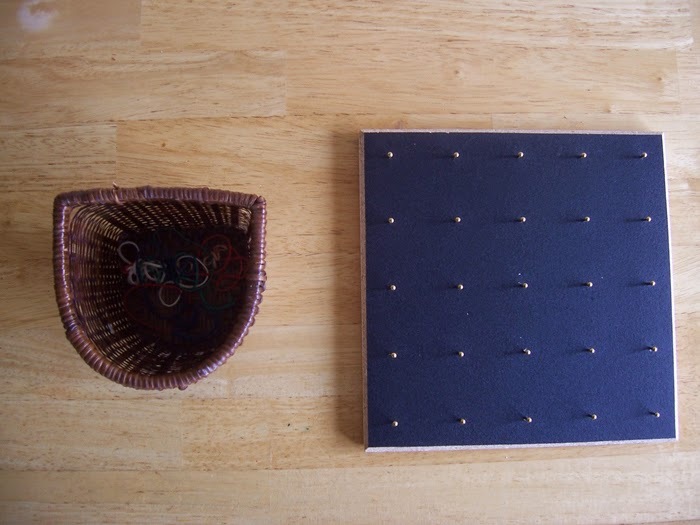 Take the geo board to a table or rug area, and take out one rubber band and place on the geo board. You can do all of the rubber bands, then take them off one at a time. Then ask your child or student to have a turn. 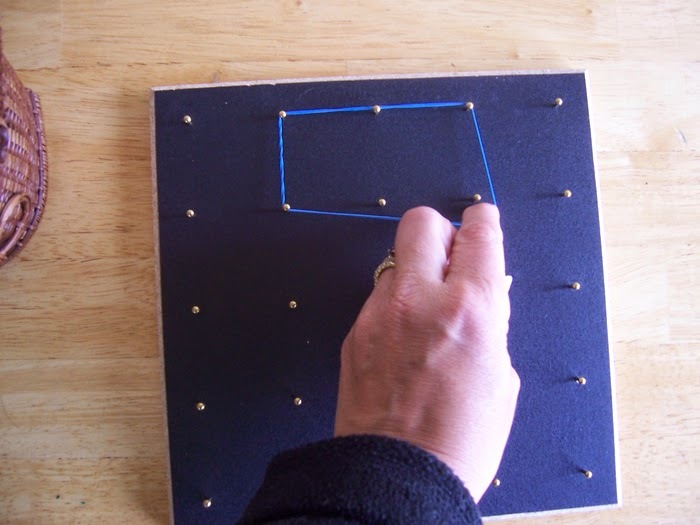 Another day take out the geo board and give another lesson on making a triangle, a square, and or a rectangle. Give the language, the name of the shape. Putting the rubber bands away can be a challenge so encourage the child to ask for help when needed. If making shapes is too difficult, show the child how to make lines starting at the top and side of the board (or any where when the child is doing it independently). 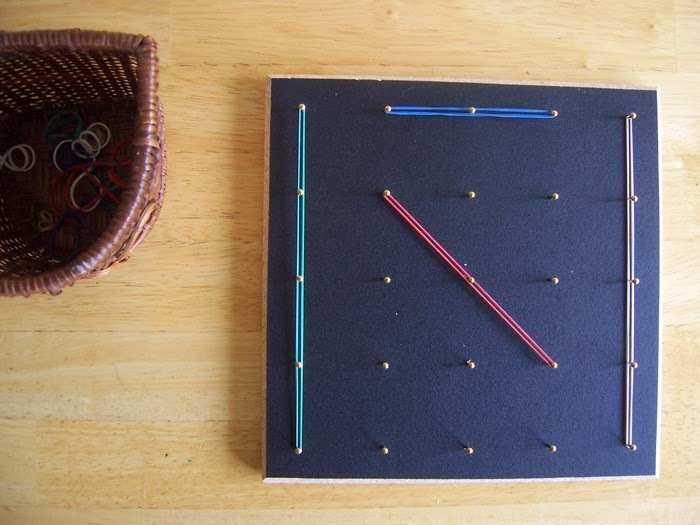 To learn more click on the link Economy Geo Board at Montessori Services, order number V17.